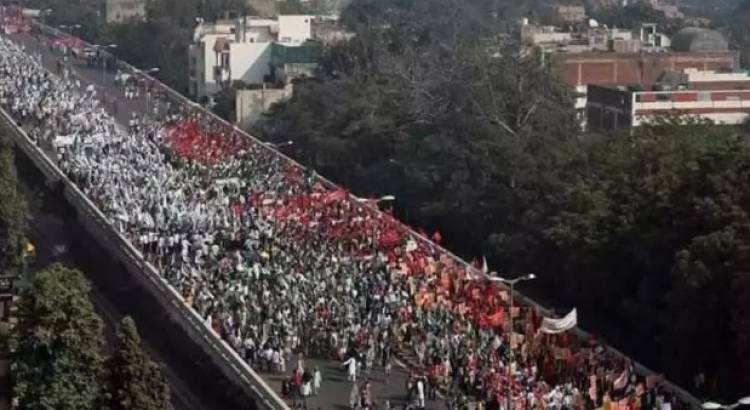 NEW DELHI: Thousands of farmers from across the country on Friday reached Parliament street in the heart of the city following due permission from the Delhi Police for a mega protest march demanding higher crop prices and farm loan waiver. Many women farmers and students, particularly from the Delhi University, were seen in the rallies raising slogans for the cause of farmers. On Thursday, several groups of farmers held 'Chalo Dilli' marches from Delhi's Nizamuddin, Sabzi Mandi Station, Anand Vihar Terminal and Majnu Ka Tila under the banner of the AIKSCC. Yogendra Yadav of Swaraj India led a 26-km protest rally from Bijwasan to Ramlila Maidan, which was joined by farmers from Odisha, Haryana and Rajasthan. Many daughters, whose farmer fathers committed suicide, hung pictiures of their dead around the neck as they marched along with the rally. The Friday's rally is the fourth major farmers rally being held by the AIKSCC, which represents over 200 farm outfits. It has been protesting against "anti-farmer" policies of the BJP government following the Mandsaur firing episode in Madhya Pradesh in 2017, which led to death of six farmers. Swabhimani Shetkari Sanghatana leader and Member of Parliament from Hatkanangle in Kolhapur (Maharashtra) Raju Shetti has introduced two private member's Bills in the Lok Sabha in 2017, seeking a loan waiver and a guaranteed remunerative prices for agricultural commodities based on the recommendations of the Swaminathan Commission. The AIKSCC has demanded a special session of Parliament so that these Bills are discussed and passed. It said 21 political parties have extended their support to the Bills. It has also written to Modi, inviting him to join the protest march. On Monday, a book authored by Yogendra Yadav detailing how the Modi government's policies have led to a drop in farmers' income and caused rural distress across the country was launched in the capital.